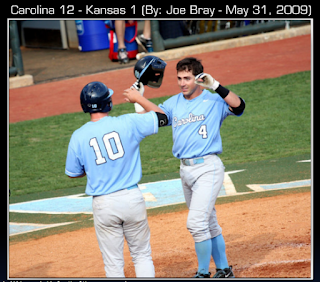 When I began attending UNC baseball games in 2006, Garrett Gore was a freshman with a good glove at second, no offense, and no nickname. Pitchers Daniel Bard and Andrew Miller would soon play in the major leagues, Chad Flack would become Mr. Clutch and a host of other players on the team seemed destined for the big leagues. Carolina would make its first of four straight appearances in the College World Series in Omaha, with Garrett as a role player. Garrett took over the starting second base role at the end of his freshman year and ended the season batting .227 and committing four errors. He finished that year at the College World Series in Omaha, one game short of a national championship. I thought Garrett would be an outstanding second baseman, but I didn't expect a lot from his bat. Garrett owned second base his sophomore year. 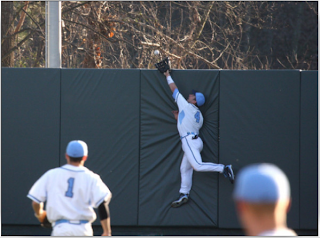 Paired with shortstop Josh Horton, the Tar Heel's middle infield was formidable. Much to my surprise, he also increased his batting average nearly 100 points to .324 and won an award for being the Tar Heel's Most Improved Player. He committed only six errors and made a second trip to Omaha, again falling just short of the championship, but he was becoming a recognized key to the Tar Heel's success. In his spare time, a scarce commodity for college athletes, he made the Dean's List. At the end of his junior year's regular season, the wheels came off. With the departure of Josh Horton to the majors, Coach Fox moved Garrett to shortstop, a very different position than second base. He came into the last few series of the season with a handful of errors, but his throws to first base began to sail on him and frequently ended up in the visitor's dugout. He would commit a whopping 21 errors before being demoted to designated hitter. Leaving the field after yet another throwing error, I watched Coach Fox meet him at the third baseline and gently tap his fingers on Garrett's temple. "It's all right up here now." As Garrett's troubles at shortstop grew, I found myself becoming a bigger fan. Ryan Graepel took over his shortstop position and Garrett was relegated to just a hitting role, but I noticed that every time we really needed a hit from him, he delivered. I cheered for his every plate appearance. My friends gave me puzzled looks, but that made me support him even more. "Shortstop isn't his natural position", I'd tell them. "The team just needed him to replace Horton. Don't give up on him." Garrett made his third trip to Omaha as the DH. Opening day of the 2009 season was also the debut of the renovated Boshamer Stadium. We had a sellout crowd and my group of friends, about a dozen retirees and spouses, had bought season tickets together. We're perhaps an unlikely bunch, retirees ranging in age from mid-fifties to nearing eighty, a few diehard Yankee fans sitting next to a few died-in-the-wool Red Sox fans. I, myself am a Kentucky Wildcat fan to the core, who loves college baseball and happened to retire in the town where the Tar Heels play their home games. Some of us went to UNC, but others are alumni of UNC Charlotte, Boston College and other fine schools. Somehow, we come together every spring to share a common love-- college baseball-- and to support a team many of us "adopted". We huddled under blankets on a cold but sunny February 20th and were surprised to find that Garrett Gore had moved to right field. Suddenly, the arm that had overthrown first base so often was throwing 330-foot strikes from right field. He threw out base runners at the plate, until they learned not to try to score on him. He picked up singles in right field and gunned down runners at first who made the turn to second a little too aggressively. He ran down everything catchable. Then he caught the uncatchable. The first weekend in March, during a tight ACC series with Clemson, the Tiger's batter smashed a pitch over the right field wall with a runner on first. Garrett ran and leaped above the fence for the ball, crashing into the padded wall, and fell to the ground. The batter began his home run strut to first. Clemson fans cheered, Tar Heel fans were silent, and the Tiger's other base runner was nearly to third when Garrett jumped up off the ground, pulled the ball out of his glove and threw to first base to double off the runner. What had appeared to be a two-run homer became a double play. Adam Warren, who would later be picked up in the 4th round of the draft by the New York Yankees said in his NCAA blog, "Garrett Gore's robbing catch on Saturday was most likely the best play I have seen in my baseball career." Garrett had also caught a nickname, "G", the ultimate sign of respect. We yelled it when he came to the plate and we watched with great anticipation when a ball was hit to right field because we knew we might see something spectacular. His batting improved, too. Going into the 2009 College World Series, he was hitting .307 on the year and had committed just three errors. In the NCAA Regional series, Kansas' coach decided to change pitchers when Garrett came to bat with the bases loaded. With only three homers through the season, Garrett drove the reliever's first pitch, a fast ball, over the wall in dead center field for the first grand slam of his career at any level. His next plate appearance, facing the same reliever, Garrett slammed a first pitch fastball over the wall in left center. A Jayhawk fan sitting behind me deadpanned, "I don't believe I'd throw him another fastball." The following weekend in the NCAA Super Regional series against East Carolina, Garrett crushed yet another homer to dead center, hitting the wall high above the 405-feet mark. If the big leagues drafted "heart", Garrett Gore would go in the first round. He wasn't drafted and I'm sure he didn't expect to be, though seven Tar Heels were. (My Wildcats had four players drafted by the MLB in 2009 themselves, thank you.) Fittingly, with all the major league talent the Tar Heels have fielded for the past four years, Garrett Gore, who wears number 4 on his jersey, is one of only four Tar Heels who have been to Omaha four times. His twenty-first College World Series appearance against Arizona State in his last college game gave Garrett the CWS record for most games played. He has been a major contributor to UNC's baseball success since he arrived on campus. He's a good student and a great kid with an infectious smile. A sports photographer commented in the caption of a photo of one of Garrett's heroics that he was one of the finest young men that the photographer had ever met, and he meets a lot of them. I met Garrett and his parents at the Boshamer Stadium dedication. I told him I was his biggest fan and that my friend's had even jokingly asked if I had adopted him. He smiled and said, "I didn't know I had any fans after last year. These are my parents. They're probably ready to get rid of me." Hardly. Every parent's dream is to raise a kid who can hit a rough patch in the road and come back stronger than ever. Garrett went to college to get an education and not just as a stop along the way to professional baseball. He didn't play to get a scholarship, either. Most college baseball players get a small fraction of a scholarship, at best. He played for a national championship and realized every ounce of his potential along the way. Sometimes, I pour my heart into a piece and work on it for months or even years. These are the pieces that I love and want people to read. Sometimes, a piece spills out onto the page in half an hour and it turns out to be one that people want to read. “G” is a bit of both. It flowed easily onto the page and it was heartfelt. I have written pieces that I love more, but I am usually writing about events that have impacted my life. This time, writing something was the event that impacted my life. “G” is about a college athlete I hardly knew at the time. I wrote it in less than an hour one evening after watching a kid who had struggled mightily the year before hit two home runs off consecutive pitches in a playoff game, one of them a grand slam. I say, ”hardly knew at the time”, because Garrett Gore and I have become friends since the column. He emailed me after reading it, we met to talk, and soon Sunday afternoons became the time we meet at Fosters Market to chat about baseball over an iced tea. We also chat about his career plans, to become a color commentator for sports broadcasts, and his final semester of college. I'm helping him with the job search and a paper he's writing on social networking. I have a son Garrett's age and two children a few years younger and it's striking how much easier it is to mentor someone else's son. Garrett wrote me that what struck him about my column was how I seemed to have seen from a bleacher seat exactly what was going on in his career. He complained that he usually reads columns by sportswriters with direct access to the players and wonders if they have ever gone to a baseball game. I suspect that's because I was writing about what was going on in his life and not about his batting stance or his on-base percentage. Garrett confided that after his last college baseball game, having been eliminated from his fourth College World Series by Arizona State, he felt a strange sense of relief. The pressure was off for the first time in a long while. He was packing his suitcase in his hotel room after that game when a sports announcer stopped by to suggest he read the column I had written. He walked into his parents' room to find his mother reading the column and crying, a revelation that I absorbed with mixed emotions. Making his mother cry was the last thing I intended. Garrett says he told her to stop crying or he would start. “G” isn't about baseball, though Garrett's amazing talent and tenacity certainly provided a great backdrop. It's about an overachieving, personable kid from Wilmington, NC with great parents and a great work ethic who hit a rough patch in the road and grew because of it. Writing his resume has been a snap.